I'm usually one for fresh ingredients, but still certainly have a few pantry staples. One of my favorites is canned chipotle peppers. These smoked jalapenos can be found in petite cans with adobo sauce and lordy, it makes an easy marinade. 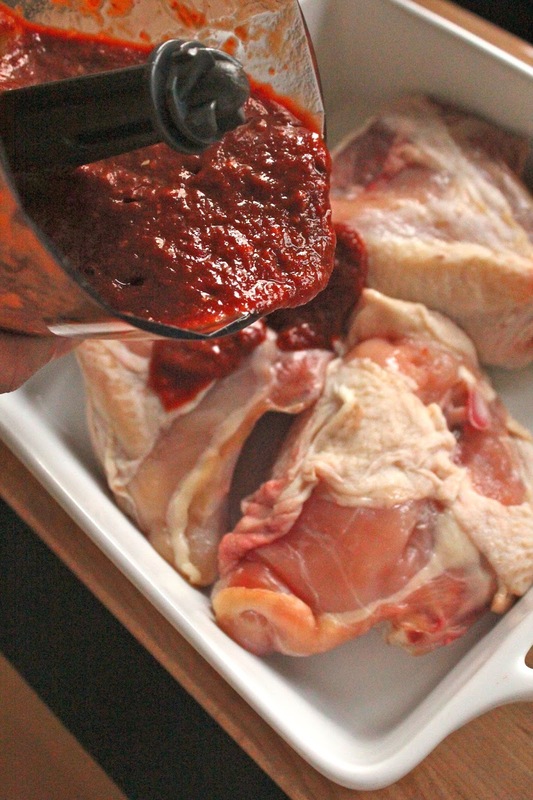 If you like spicy and smokey, you'll die for this quick sauce. 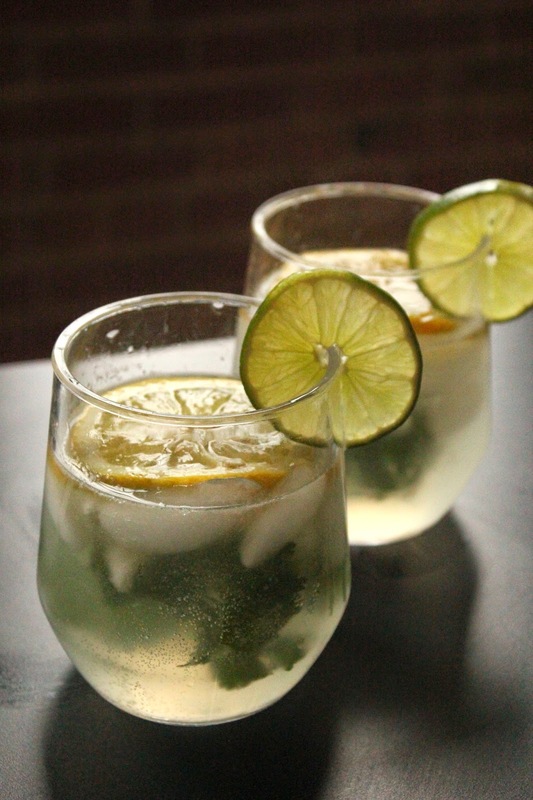 A quick buzz in the food processor and you've got a delicious flavoring for grilled chicken. Chop it up and you've got saucy tacos ready for any taco Tuesday. Tacos not your jam? Try this solo or to spice up a salad. Simply combine the canned peppers with fresh lime juice and garlic in a food processor. Buzz, brush and grill. 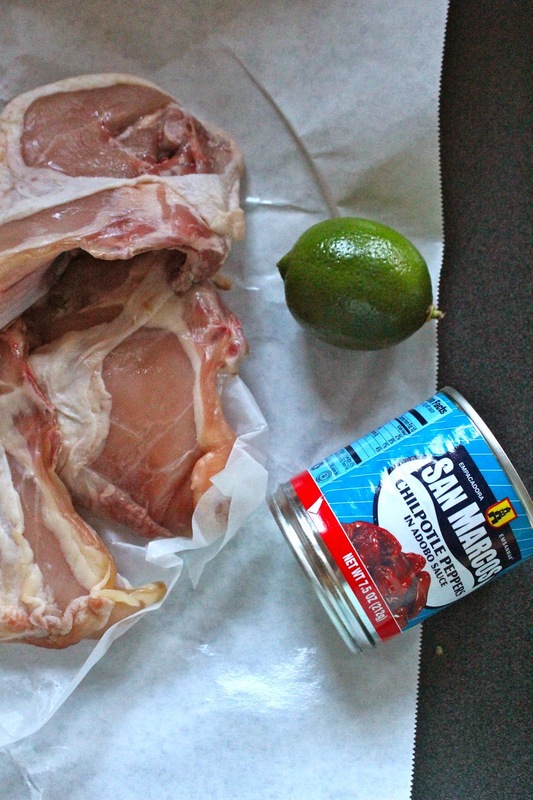 I usually reserve a bit of the marinade to toss with the cooked meat, especially if I'm making tacos. It gives the extra saucy punch and whew... brings delicious heat. 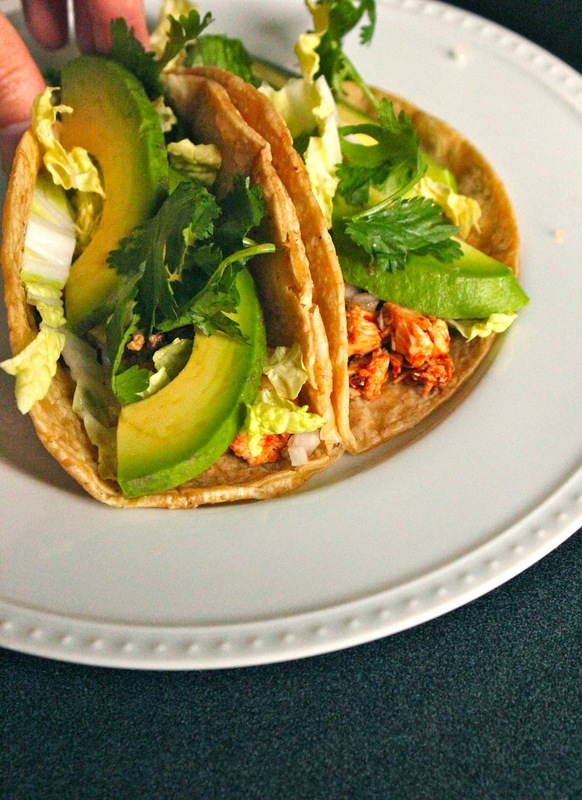 Layer the adobo chicken into corn tortillas and add cabbage, cilantro and avocado. This flavorful meat will give even the best taquerias a run for their money. 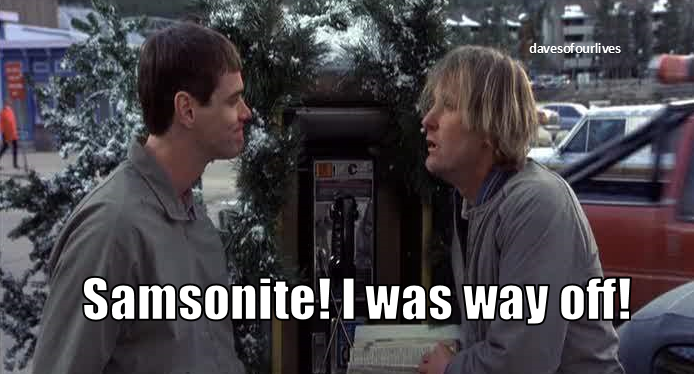 And who knew it could be so easy? 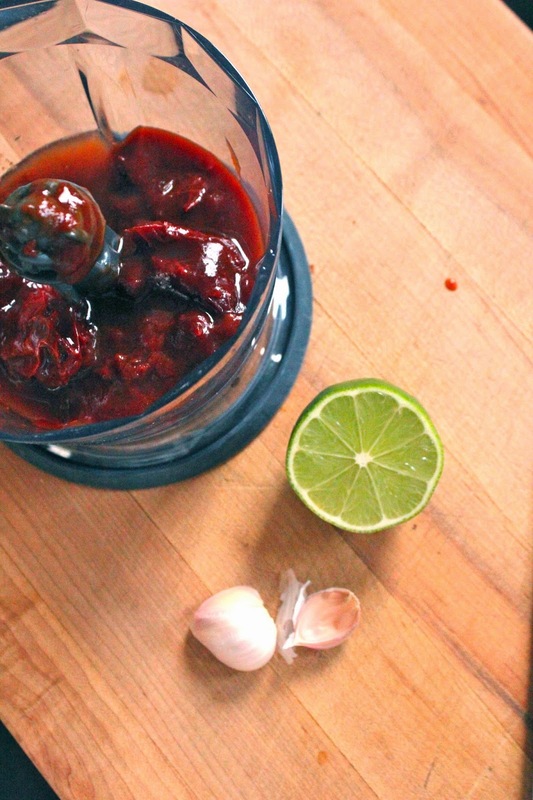 Combine chilis and sauce with lime juice and garlic in a food processor. Buzz until smooth and combined. Reserve a 1/2 cup sauce and brush the rest over chicken. 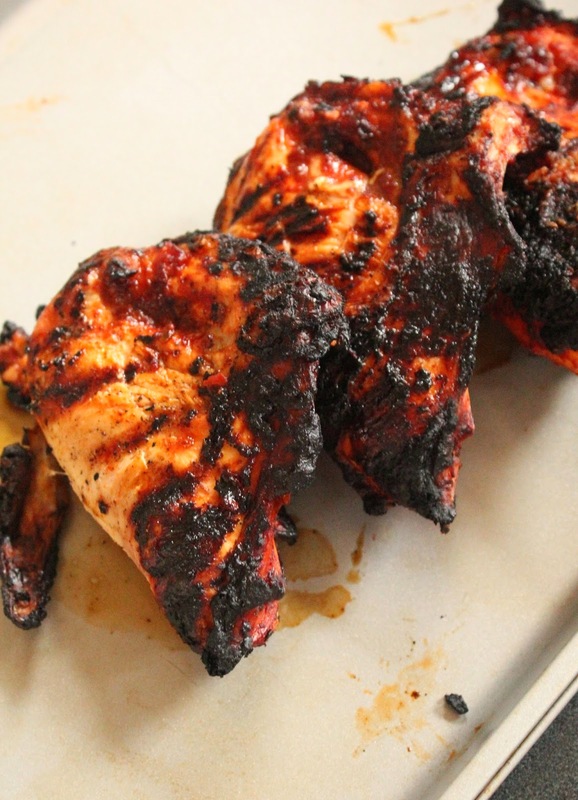 Grill chicken over medium-direct heat for 6-10 minutes or until 165 degrees internally. Remove from grill and allow to rest about 10 minutes. If preparing tacos, chop and toss with remaining sauce. This chicken is also excellent on its own or over salad. Enjoy! I feel a little crazy, but I seriously can't get enough of spring. The husband is surely annoyed with me going on and and on, and I literally have been stopping to smell the lilacs every time I pass. The leafy trees just get me in the mood for green on the plate. Each verdant plate forgiving a buttery bowl of winter. With this craving, I went for green on green on green on green. 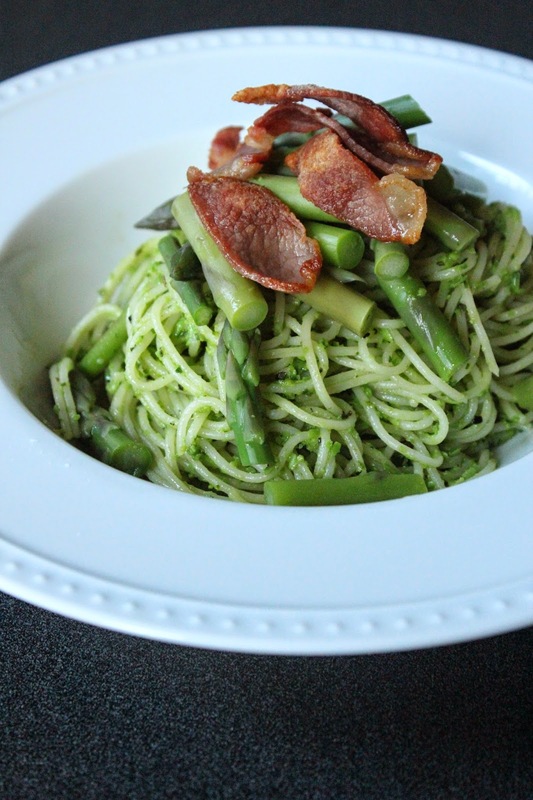 How much springy life can you get in one dish? 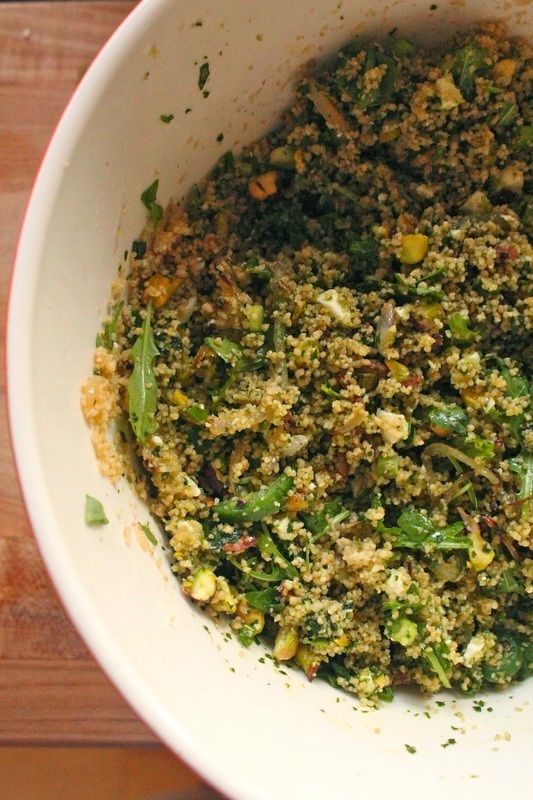 This couscous goes for it with gusto. If you're a vegetable lover, you simply must check out Plenty by Yotam Ottolenghi. Not only is it one of the most beautiful cookbooks I've ever seen, but the vegetable recipes will ignite your creativity and palette. It's been one of my go-to books with the return of fresh veggies and inspired this recipe. 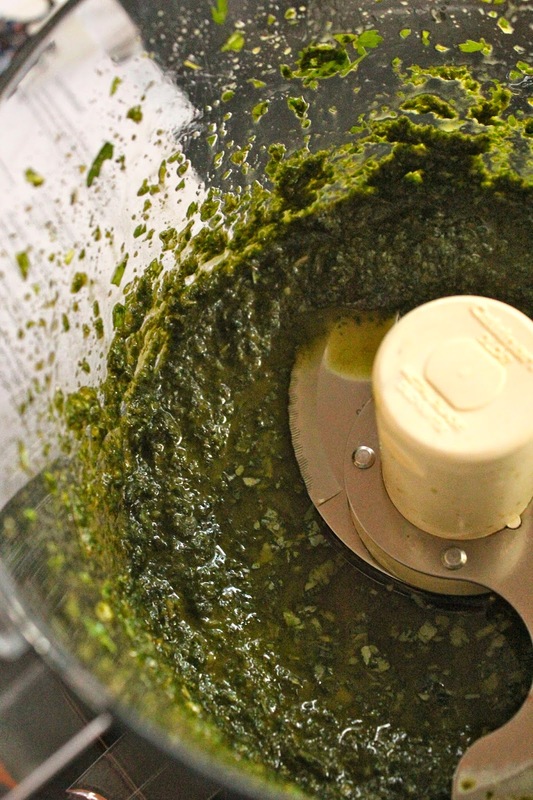 For this recipe, you'll make a quick herb paste in the food processor that will flavor the entire dish and provide a gorgeous green base color. 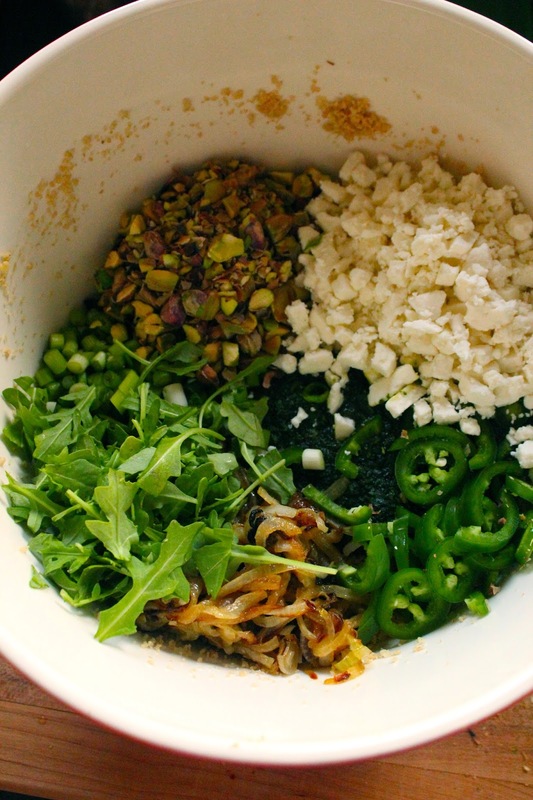 Then simply toss the paste with pesto and lots of other green goodies, like arugula, jalapenos and pistachios. I love making salads like this on the weekends and then packing them for lunch throughout the week. If you're looking for something more substantial, serve this with fresh-grilled white fish. This fresh bite will get you in the mood for picnics and the smell of fresh cut grass. Enjoy it on the patio if you can, or at very least, dream about cool morning dew on bare feet. Place couscous in a large bowl and stir in boiling water. Cover with plastic wrap and set aside for at least 15 minutes. Heat 1 tablespoon of oil in a pan over medium heat and add onion. Cook until lightly browned and soft, add salt and cumin in the last minute of cooking. Allow onions to cool. 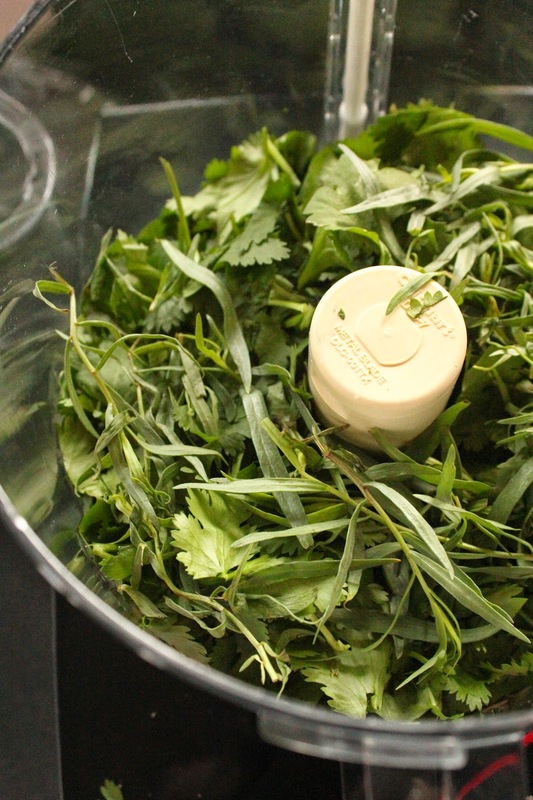 Combine basil, cilantro, tarragon and remaining olive oil in a food processor and buzz until full incorporated. Toss couscous with herb paste and cooked onion. 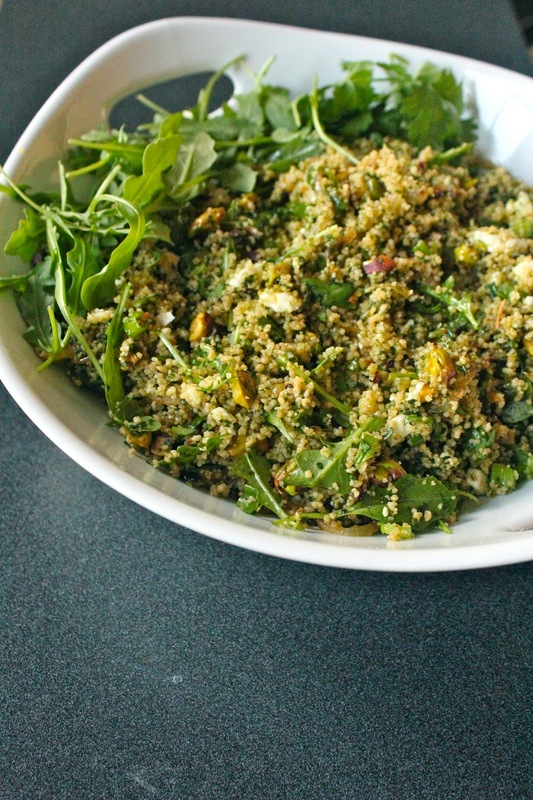 Stir in pistachios, green onions, jalapeno, arugula and feta cheese. Enjoy!